This is the 3rd Alex Kidd Game on the Master System. 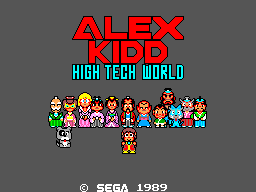 And actually it is no Alex Kidd Game, as the Original Version of the Game is called Amitsu Hime and was released in 1987. I guess Sega just changed the Main Character to Alex for an worldwide release. The Story of this game is absolutely silly: A Friend of Alex tells him about a new Arcade which as opened, but the only map to the Arcade got torn into eight Pieces. So you must find them, get out of your castle, fight your way trough a horde of ninja, who want to prevent your arrival at the arcade. Alex takes a break from jumping around, as High-Tech World is more a puzzle game and not a Jump 'n' Run. At first you are in the Castle and must find the 8 Pieces. To make it not to easy. On your Way trough the Castle you meet different Persons who ask you questions or give you items, which helps you to find the map pieces After finding the map you head for the Arcade in the Village. Now the game gets back to an jump n run and you must fight your way trough a bunch of ninjas. The Ninjas are a bit unfair as they move a lot faster than Alex. 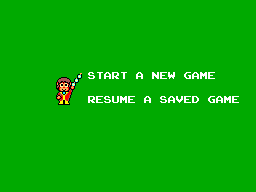 Also this Game has a Save-Game option. A bit unnecessary in my opinion as High-Tech World is a pretty short Game. The Graphics are not too bad. Everything is bright and well drawn with quite a lot of detail put into it and almost every characters looks different, even minor characters are nice done. So the Graphic is the best thing of this Game. 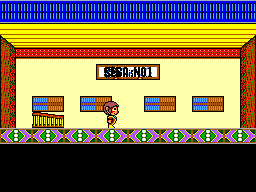 Nearly the same childish music like in Alex Kidd: The Lost Stars. The songs in the Castle make you think you are in an circus. The Movement of Alex is a bit messed up as its a bit hard to climb ladders as you must move Alex right at the beginning and then press up, sometimes Alex doesn't want to move. There's practically no replay value, as this game is short and there is nearly no reason to play this game again. This is the worst of all the Alex Kidd Games. Actually you could describe the first 3 Games with a title from an old western: The good, the bad and the ugly.